Why Professional Beauty for obesity surgery in Belgium? Gastric band treatment for obesity - how does it work? 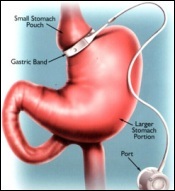 The adjustable gastric band (lap-band) is the most popular form of weight loss surgery in Europe and Australia. It is one of the least invasive approaches to obesity because neither the stomach nor the intestine is cut. To date more than 150,000 lap-band surgeries have been performed. Since the gastric band is implantable using minimally invasive techniques ('keyhole surgery'), patients who are extremely obese with heightened surgical risks benefit from the conservative entry to the abdominal cavity. The gastric band is applied around the stomach about 15 mm below the gastro-oesophageal junction. On the inner lining of the band there is a longitudinal balloon (like a bicycle tyre). This balloon is inflated through a small tube attached to a subcutaneous port. The band is left empty at time of surgery but is thereafter gradually filled with fluid by injection through the subcutaneous port. It is thus possible to vary the opening in the stomach after surgery.